More than 10,000 voters from across the state weighed in on 101 things they love about Northern Michigan. Their votes determined 303 Red Hot Best winners and 700+ honorable mentions. 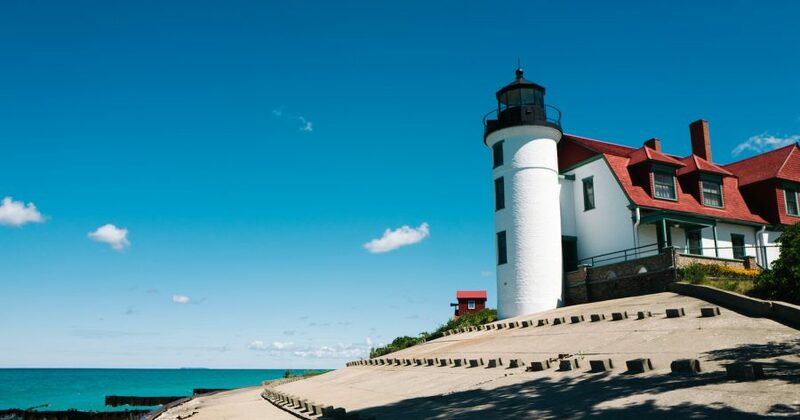 Here you’ll find the best Northern Michigan lighthouses to visit on your next vacation. From morning’s clear light to the neon orb of sunset, this hipped-roofed queen of the Benzie County shoreline is a beacon of beauty. Bring your camera and a bathing suit—the beach is amazing. Open to tours; $5 for adults and $2 for children ages 6–11. This beautiful light stands guard at the tip of the peninsula with a sandy beach out front. Admission to the first-floor museum is free; $4 for adults and $2 for children ages 12 and under to climb the stairs to the top. Be a Mission Point Lighthouse keeper for a week! See the restored keeper’s dwelling and climb the tower for a spectacular view of Lake Michigan, Cathead Bay, Grand Traverse Bay and the Manitou Passage. Admission is $4 for adults and $2 for children ages 6–12. (Ask about the lighthouse treasure hunt!) Before you go, take this video tour of the Grand Traverse Lighthouse and read this ghost story—you never know what you might see. Enjoy aerial views of the Frankfort North Breakwater Lighthouse!